Flour is a fine powder made by grinding various grains. It is most commonly made from wheat, but other grains, such as rye, spelt, and corn, can also be used. Flour has 5 major functions in baking. 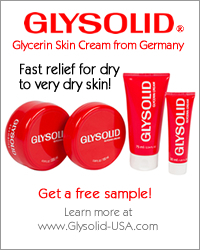 • It acts as a binding and absorbing agent, since flour absorbs liquid instead of dissolving. Some flours (such as wheat and spelt) contain proteins, called gluten. Gluten gives structure and strength to baked goods. For gluten to develop, it must first absorb water. Then, as the dough or batter is kneaded or mixed, the gluten forms long, elastic strands. As the dough or batter is leavened (through yeast or chemical leavening agents, such as baking powder and baking soda), the elastic strands capture the gases in tiny pockets, and we say the product "rises." When the product is baked, the gluten solidifies and gives structure to the product. 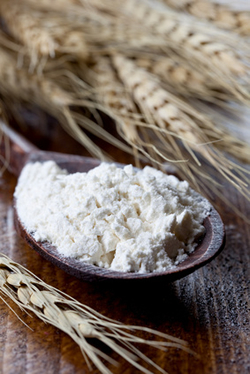 In the United States, wheat flour is designated by the amount of gluten content it contains. In Germany, however, flour is designated by number, representing the amount of ash found in 100 grams. This becomes a problem for the baker trying to use a german recipe. So, below we provide a list of common flours used in german baking, as well as the U.S. equiavalent. Germany's Flour Type 405 is equivalent to pastry flour. Pastry flour is made from soft wheat and has a gluten content of 8-10%. It is soft and ivory in color. Because of its low gluten content, it is best used for baked goods that should have a soft consistency yet still needs some structure, such as muffins, buscuits, pie crust, tart dough, cookies, some sweet yeast doughs, etc. Pastry flour is available in the U.S. in health food stores, specialty stores, and mail-order businesses. To make a flour with the same gluten content as pastry flour, combine 1 1/3 cups (185g) all-purpose flour and 2/3 cup (90g) cake flour (which is available in most markets and has a gluten content of 6-8%). Germany's Flour Type 550 is equivalent to all-purpose flour. All-purpose flour is made from a blend of hard and soft wheats and has a gluten content of 9-11%. It can be bleached or unbleached, which are interchangeable (bleached flour is whiter and has less vitamin E than unbleached flour). All-purpose flour is used mainly in home baking because it is the most versatile flour. It can be used in baking a large variety of goods. However, breads won't be as chewy as if bread flour was used. Likewise, cakes won't be as tender as if cake flour was used. All-purpose flour is not typically used by professional bakers. Germany's Flour Type 812 is equivalent to bread flour. Bread flour is made from a hard wheat and has a gluten content of 11-13%. It is pale yellow when first milled and turns off-white with aging. It feels slightly granular when rubbed between your fingers. This is the best flour to use for breads and hard rolls. Its high gluten content gives bread the structure needed to rise and hold its shape. High gluten flour is a white flour made from hard wheat and contains at least 13-14.5% gluten. It is best used in conjunction with other grains and flour to provide more structure. It is also good for breads that are extra elastic such as bagels and pizza. High-gluten flour should not be confused with vital wheat gluten, a pure gluten powder that can be used in small amount to strengthen weak flour. 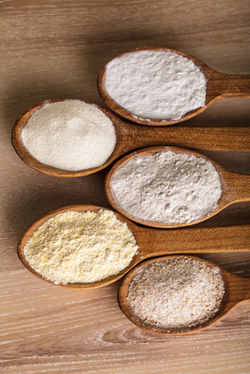 To make high gluten flour, all-purpose and bread flours can be supplemented with vital wheat gluten. Vital wheat gluten is found in small bags at specialty and natural food stores. Follow the instructions on the package of the vital wheat gluten for proper proportions. Germany's Flour Type 1600 is equivalent to whole wheat flour. It is brown in color and is derived from the whole wheat kernel, including the germ and bran. It is more flavorful than white flours which do not include the germ. Because the germ is included, there are more nutrients, fiber and fat in whole wheat flour. When used in bread baking, it gives a nutty flavor and a denser texture when compared to white flours. Bread made from whole wheat flour is heavier and does not rise as high as breads made from white flour, so often a combination of whole wheat and white flours are used. Germany's Roggen Mehl Number 1150 is equivalent to a medium to dark rye flour. Rye flour is darker than flours made from wheat and it has higher amounts of vitamins B and E.
Rye flour is used most often for breads and bread rolls. It imparts a slightly sour flavor to breads. Breads made with rye flour have a longer shelf life and taste fresh longer than breads made with wheat flours. It is also often combined with other flours because of its low gluten content. Germany's Roggen-Vollkornmehl flour is equivalent to pumpernickel flour or a whole rye meal. It is a flour made from the whole rye grain, including the bran and germ. Breads made with whole rye flour are hearty, with a slight sour flavor, and have a grainy texture. Whole rye flour is often combined with rye flour or other wheat flours to produce a smoother and lighter taste. Germany's Dinkel Mehl 630 is equivalent to white spelt flour. It is a flour made from finely milled spelt grain. In Germany, it is often used instead of Flour Type 405. It is excellent for bread baking, but is usually combined with other flours because of its high gluten content. Also, because it is high gluten content, bread doughs made with 100% spelt flour can quickly become over-kneaded, resulting in a tough, dry product. Germany's Dinkel-Vollkornmehl is equivalent to whole spelt flour. It is a flour made from the whole spelt grain. In German recipes, the amount of flour needed is identified in grams. However, unless you have a baker's scale, it will be hard to determine exactly how much you need. So, we provide some grams-to-cups converversions below as a guide. Sifting flour removes any lumps and aerates it so that liquids will be absorbed more easily. If your recipe calls for "1 cup sifted flour," sift the flour first then measure it. If the recipe calls for "1 cup flour, sifted," this means to measure first then sift. Flour is sometimes labeled "pre-sifted." This means the flour was sifted before it was packaged. However, during shipping and handling, the flour compacts and is no longer sifted by the time you use it. So, if your recipe calls for sifted flour, you will have to sift it yourself. Proper measuring of flour is very important. Too much flour results in a dry or heavy product, wheareas too little flour results in a product that is too moist or weak. When measuring flour, spoon flour into a measuring cup, then level off the cup with a knife. Do not pack the flour down. When packaged, flour has about 14% moisture content. When stored, its moisture content diminishes, so the longer it is stored the more moisture it loses. So, on a day with low humidity and using old flour, your dough or batter will require a little extra moisture or a little less flour.